It’s a beautiful Memorial Day in sunny Boston and we’re putting the final touches to preparations for iCubeSat 2012. You can collect your badge and conference bag (including the book of abstracts) from 1PM onwards tomorrow (Tuesday) on the sixth floor of the MIT Media Lab (building E14, room E14-633 to be precise). We have lots of signs and maps here so you shouldn’t get too lost. If you haven’t done so already, please upload your presentation/poster and optional paper as described here today as tomorrow will be too late. 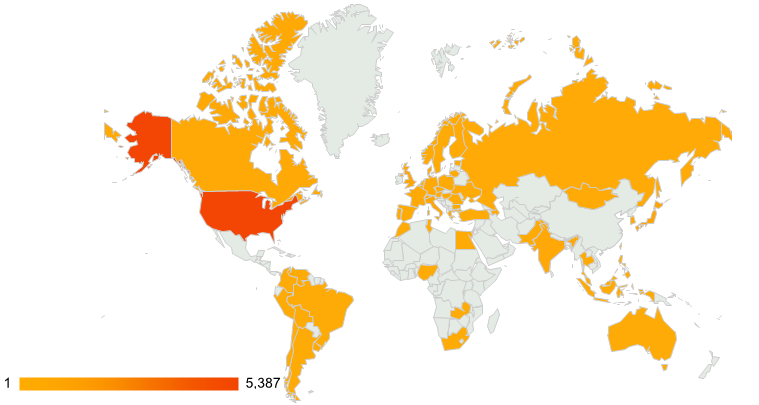 As you can see from our visitor statistics map (above), this is an international interplanetary event! Details of the live streaming service for those who haven’t been able to make it will be posted here when the workshop starts at 2PM tomorrow – see you then! This entry was posted on May 28, 2012 at 3:24 pm and is filed under Uncategorized. You can follow any responses to this entry through the RSS 2.0 feed. You can skip to the end and leave a response. Pinging is currently not allowed.